I am slowly coming to accept that I am not the young buckette (is that doe?) I once was. I had a crash course in recognizing my limitations when I got sick. Now I know that I won’t run any more marathons, climb any more mountains, or participate in any more aerobics classes that will cause me to break a sweat. But every so often I forget. Occasionally I try to run a little bit and my body quickly reminds me to stop. I seem to be the last person leaving every yoga class I attend–I roll my mat and collect my things at a snail’s pace. Everything takes longer than it used to when I was youthful. I moved with vigour once, but now I’m slow as molasses. In fact, recently I gave up rushing altogether, and I must say I don’t miss it. I’m not the only one who is aging. Jelly turned 7 last month, which means she is now a doggy senior. Although she looked like a puppy until a year or two ago–even dogs want to believe they look younger than they are–even her little red eyelashes are now turning grey. I’ve noticed she’s never been asked for identification for a senior’s discount. Except for last Friday morning, when Jelly temporarily forgot that she too is no young buckette anymore. 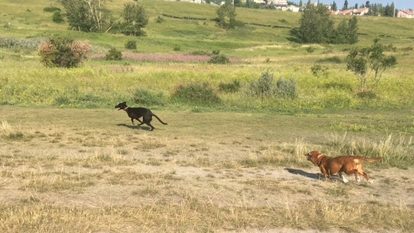 She met up with Kona, a lovely tall greyhound cross, who seemed intent on a running mate. Kona egged Jelly on persistently, resulting in an all-out no-holds-barred chase around the park. Kona was born to run. She easily outpaced Jelly, who persevered nonetheless, cutting the odd corner when she needed to. Jelly fought the good fight, until she tanked, whereupon she slowly limped back to the car. I knew exactly how Jelly would feel following that romp. I knew she would regret running herself ragged, but there was no way I could convince her to pass on the opportunity. We all need to learn from experience. Has anyone ever heeded the wisdom of elders? I was not surprised that Jelly spent most of the weekend recuperating. Will her stiffness stop her from trying to outrace the next greyhound that wants to be chased? Probably not. She’s a dog, and she does not always learn from experience. Come to think of it, neither do I. But all is not lost. Despite Jelly’s recent stiffness and fatigue, every time the wind blows, she rises from lounging and leaps off the deck, positioning herself under the apple tree in case a delicious snack happens to fall. Each time, I drag myself agedly out of my chair, thereby granting Jelly ample time to wolf down her spoils. Jelly’s body may be old, but, at least when it comes to food, her mind is forever young. I just heard that you have been excluded from marching in uniform in Calgary’s Pride parade this year. You are allowed to march only in civilian clothing but without police vehicles or floats or sidearms. I have read that you plan to attend despite these restrictions to further relations with the LGTBQ community. God bless you for that. In your shoes (are you allowed to wear shoes? ), I’d boycott the event altogether. The Pride organizers still want you there on the sidelines, in uniform, ensuring that everyone is safe. Good thing, since were I to attend, you might have to restrain me from telling the Pride organizers how I feel about their decision. This decision of exclusion has been made to spare persons of colour the post-traumatic stress that could be triggered by seeing police in uniform. I feel for these people, and I understand relations between police and these groups have been strained, but I do not understand how eliminating your uniforms will aid relations. These marginalized groups will still see you in uniform on the sidelines that day, and on other days patrolling the streets. I wish I could talk directly to these groups because, as a psychologist, I know this decision will not help them to resolve their PTSD. In fact, the lack of uniformed police presence at this event may only exacerbate these feelings. PTSD is an anxiety disorder not to be taken lightly. Traumatic things happen to people, and, for some, PTSD can be the result. By excluding you, these groups lose the opportunity to see that police are not to be feared in all situations, that they are marching in support of the whole LGTBQ community, of which these groups are a part. This decision has been made by Calgary Pride organizers, but I do not believe it reflects general consensus of the LGTBQ community. I, for one, do not support it, nor does my wife, nor do any of the Calgarians, LGTBQ or not, that I have spoken with. I have expressed my discontent to Pride Calgary but received only a form letter in response. I feel sad that I will not be at the Pride parade this year. For many years, I’ve looked forward to attending with friends and supporters. I am there on the sidelines, hooting and hollering and stealing candy from children. I’m also known to tear up when I see all of the brave marchers, especially those in uniform. Once a very kind female officer noticed my tears and stopped to ask me if I was okay. I had to explain to her how grateful I was for CPS’s attendance. Perhaps I am most sad because, in the past and continuing to this day, LGTBQ people are mocked and maligned and discriminated against for dressing or acting in a way that is not considered within the norm. We have fought so hard for inclusion and Canada especially has made great strides. Sadly (and ironically), this no-uniforms decision is one of exclusion. You deserve better. Calgarians of all colours and races and orientations are grateful for your service. If our Pride party, now relocating to the backyard, gets out of hand, I’m glad to know that I can always call you. One potato, two potato, three potato, more? This morning at the park, Jelly saw 6 dogs and 10 balls. You do the math. (Don’t forget to solve for both x and y.) How I long for a dog that ambles through the open meadow, sniffing the peed-on fragrant wildflowers. Is that too much to ask? I’m sure you’re dying to know, after all this time, “How does your garden grow, Annie?” I have learned so much since we started this new venture, but I have so much more to learn. Don’t ask me for gardening tips because I don’t have any. Follow the instructions on the seed packet, water regularly, and enjoy the spoils. Rule-bound gal that I am, I have followed the seed-packet instructions to the letter (with one exception noted below), and I have something to show for my diligent efforts. I spaced the seeds the required distance, planted them at the required depth, watered them regularly (more often I’ve watched J. water them), and we are now starting to reap the vegetables of our labour. We have harvested the odd tomato from our thriving plants, one little red strawberry from our patch, and several salads’ worth of lettuce and kale. If all of our little green tomatoes ripen, we will have enough to eat bruschetta and tomato soup and tabbouli for months. 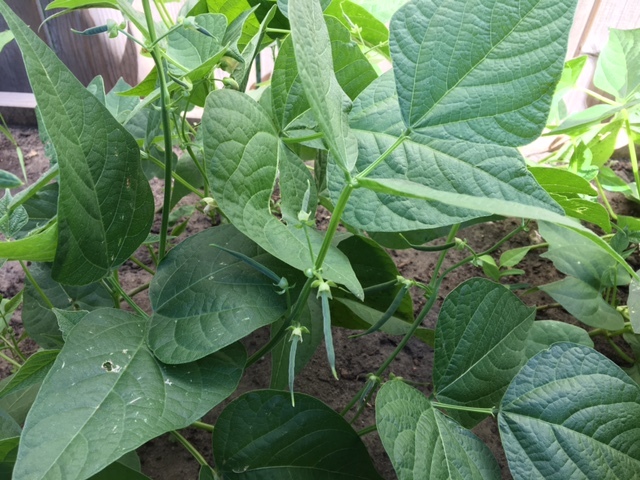 Our beautiful little flowers on our bean plants have become itty bitty beans, which will hopefully continue to grow so we can eat them someday. Thankfully, Jelly continues to help thin our greens. No more supermarket kale for her; the garden variety is so much tastier. The dog is adept at thinning, but on this front I have failed. Thinning would involve destroying a plant I have lovingly nurtured. Why would I kill the runt of the litter? Don’t all seeds deserve a full life? You won’t be surprised to learn, then, that our larger-than-life zucchini plants are encroaching not only on one another but on all the now-sun-deprived plants around them. As I write, mounds of mini zucchini are fighting for their lives. It will be survival of the fittest, plant edition, in our zucchini patch. Today we jumped an especially exciting garden hurdle. 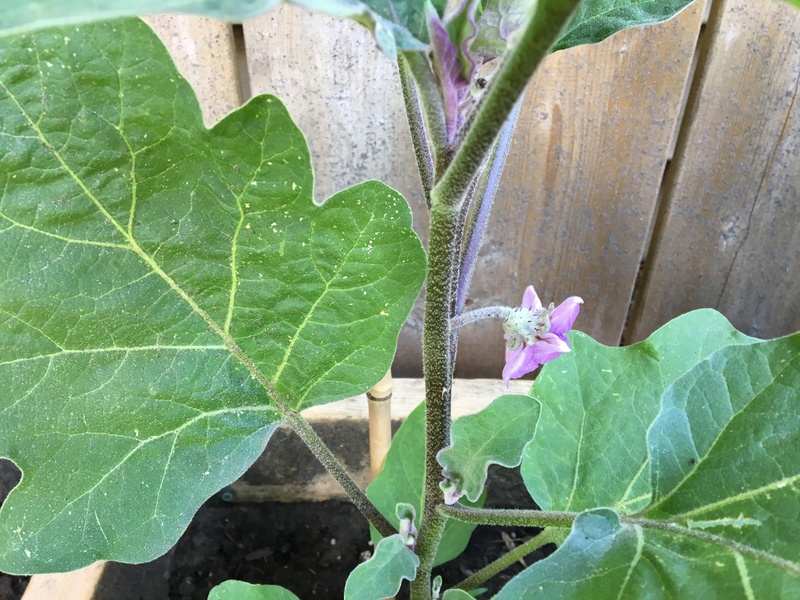 After weeks of watching our eggplant plants take root, we were blessed with our very first eggplant blossom. Eggplants are not grown in this climate because our growing season is short, so I’m trying to temper my excitement. We are crossing our fingers, between waterings, for at least one batch of baba ganoush before the first frost. 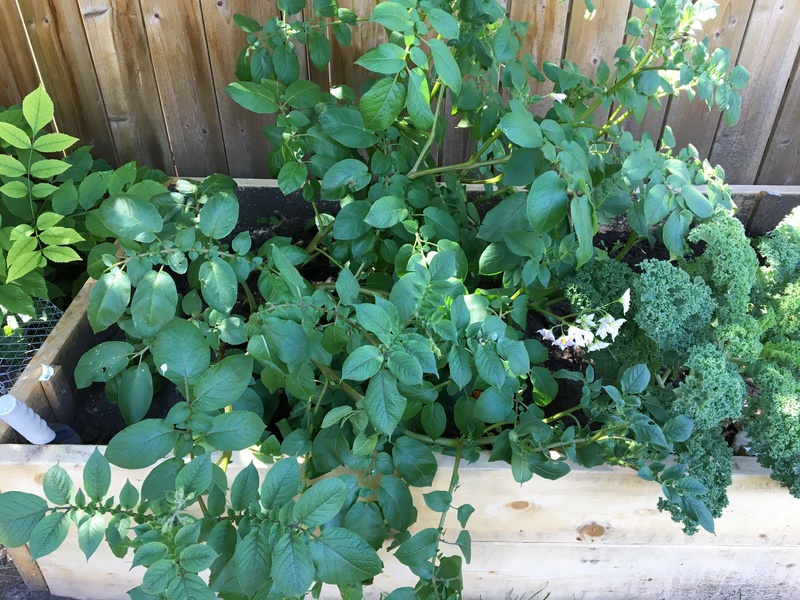 Can you guess how many potatoes are growing? As you can probably tell, I still have a lot to learn. For example, J. recently taught me that one huge potato plant may bear many potato babies rather than one ginormous one. Potato plants are notorious for multiple births, I now understand. Here’s hoping we’ll grow at least enough taters for a side of tots. Next year’s garden can only improve over this year’s, right? I won’t plant as many radishes, I will remember to plant my greens out of Jelly’s reach, and I will thin my zucchini. What are we possibly going to do with all those zucchini? Suggestions are appreciated. Better yet, steal some. We’ll never notice. Jelly and I have been heading to the off-leash dog park most mornings. Whenever we go, I am struck by the number of dogs who are fixated with a tennis ball. These dogs are excited to be at the park not to see their compatriots but to chase that ball relentlessly, drop it at their owner’s foot, only to chase it again. These dogs live to fetch. Bassets and fetching? Not so much. If I threw a rabbit, they’d run after it. Bunny chasing is in their blood. Ball chasing? Forget it. Jelly has learned to ignore dogs with balls because she knows they will not be interested in playing with her. I’m getting off track. 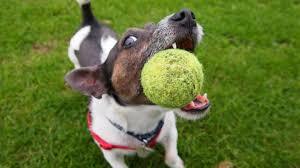 It’s dogs with the other kind of balls, the kind attached to their bodies, that pose the problem. Jelly can spot those dogs a mile off. She doesn’t run much at the park anymore, except when she sniffs out an unneutered male. Then she’s emits a whimpering cry unlike no other and chases relentlessly after that dog until I manage to snag her, leash her, and take her away. I no longer ask the owners, “Does your dog have balls?” I can tell by Jelly’s squeals and rapt attention that the dog does indeed, whether or not his wares are on display. I say this because recently I learned that when girl dogs are spayed, only part of their parts are removed, ensuring that they cannot reproduce. But other parts remain, leading dogs like Jelly to be tormented by their desires for the rest of their lives. No wonder girl dogs, spayed or not, just want to have fun. After an incident like this, we head to the balls-free zone of the park, where Jelly can frolic in peace. Those other balls may fly overhead, begging to be fetched, but Jelly ignores them. During this week’s PALS visit at the retirement residence, Jelly and I crossed paths with a visitor who had brought along her dog with balls. No, I couldn’t see them, and they weren’t neon yellow, but Jelly quickly became entranced. Everyone nearby was tickled by Jelly’s relentless interest in this dog. I immediately pulled Jelly away from this dog before her squealing escalated to howling in the echoey hallway. Jelly may be a doggie senior, but some days she acts more like a teenager with a crush. They say hormones can rage at any age. If you don’t believe me, join us at the park one day. Once upon a time I was a dieter. I lost weight, sometimes too rapidly, for short periods of time, but most often I gained it back. I have come to believe that I cannot sustain restricted eating for any period of time. Eventually I fall far off the perpetually-hungry wagon. As soon as I start forbidding myself certain foods or food groups, I crave them all the more. Some things I have been advised not to eat for health reasons, and I can live with those few restrictions. Grapefruit is a no-no with many of my medications. Organ meats are one of the worst things a gout-prone person can eat. Although chopped liver is a Jewish staple I consumed frequently in my youth, I’m surviving fine without the delicacy as an adult. I may be on a low-sodium diet, but I still eat the odd sodium-laden restaurant meal and I enjoy the occasional potato chip from J.’s stash. Right now, I’m losing weight rapidly, but I can assure you I’m not dieting. Six weeks ago now, my hunger switch blew a fuse. I went from eating normally, sometimes excessively, to nary a hunger pang. Normally I’m one of those people who goes from zero to ravenous in seconds. I’m perplexed I haven’t been approached to star in one of those Snickers commercials. 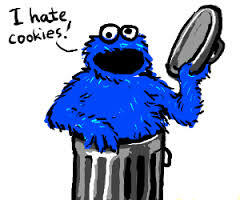 My hungry alter ego would be a hybrid of Oscar the Grouch and Cookie Monster. Currently my hungry-grumpy self is on vacation. I eat because I know I have to, but I’m full in no time. I’m oddly fascinated by this turn of events. When I was discussing this problem with one of my doctors, she said that there is a fine line between lack of appetite and nausea. I have been straddling that line, but remain firmly on the lack-of-appetite side. I’ve told you many times that I am not a puker. I don’t recommend this extreme approach to weight loss and I can’t tell you how to start your appetite loss. I am not intentionally trying to lose weight; I am having trouble eating. There is a huge difference. It’s been a while since I’ve craved a particular food and felt compelled to satisfy the craving. I miss the old days when I ate with enjoyment. This experience is not all bad, of course. I can leave the house unconcerned about missing a meal. I no longer need an emergency snack ready for consumption at all times. And I am miraculously slipping into clothes that haven’t fit for some time. Whenever I clear out my closet, J. encourages me to hold on to some smaller-sized clothes just in case. I must be going through a just-in-case phase. I may sound too cavalier about my shrinkage, but my doctors have reassured me there is no cause for concern. So long as I’m feeling alright (which I am), and my blood work is largely unchanged (which it is), I am not worried. I expect my appetite will come back with a vengeance once I figure out how to replace the fuse. With my renewed appetite, my lost weight will miraculously reappear. In the meantime, let me enjoy a few weeks in my skinny jeans, alright? Yeah, sure, sometimes I’m grateful. Let’s start this post by saying that I don’t buy a lot of clothes. But a few days ago I bought a t-shirt, size medium. (Hopefully it will still fit me when my unintentional hunger strike ends.) It says #grateful across the front, which I find a little Oprah-esque, but I liked it anyhow. I don’t like to preach gratitude but occasionally I do find myself thinking of things I’m grateful for. Being alive is the most obvious one. Soon after I bought the shirt, as if by fate, I had a texting exchange with a doctor friend, my second debrief of sorts with him following last week’s adventure at the urgent care clinic. He was kind enough to check in the evening of my incident, and somehow we got to texting again on Friday afternoon. I was worried my friend might be angry with me for what I’d recently posted about my visit to the clinic because he’s the kind kind of guy (no, that was not one of my frequent editing errors) whom I imagine feels responsible for anyone’s mistreatment by a medical professional. That’s quite a burden to bear, don’t you think? I reminded him that he can let that go. When I asked him whether he was angry with me for what I’d written, he responded: I could never be angry with you. To say I was touched by his response would be a gross understatement. The sentiment actually brought tears to my eyes. I know, you’re not surprised. Sometimes someone says something to me that I know I will never forget. Some are traumatic moments, the ones where someone has blurted out something very hurtful or mean. We all have moments like those, interactions where we feel shamed or belittled or bullied. I try to let these incidents go because I don’t find stewing about them helpful. Sometimes I am successful but sometimes I am not. But the moments where someone says something that kind and supportive, those are moments I want to hold on to. I must have reread the text several times before I deleted it. It has been a great comfort. Has anyone ever told me that I could never evoke anger? No one, ever. I understand why. I spend my days infuriating people with my irritability and cluelessness and rigidity and all my other tiresome quirks. Maybe this dear friend doesn’t know those annoying sides of me that would drive him crazy were we to spend too much time together. Or maybe he does know how difficult I can be, and he still chose these words of support. That’s a true friend. So everyone should know how grateful I am. Thanks, dear friend, for debriefing with me after your very long day of work. And thanks for your continued kindness when we caught up a few days later, even if you were disinhibited by your first vacation beer. This post’s for you, bud. And now I must go put on my new t-shirt, to drive the point home. It’s been an unusual week as both J. and I have been mistaken for heterosexuals. Maybe this happens more often than we know–“Hey, honey, look at those two gals holding hands. Maybe they’re sisters!”–but we don’t realize it. You’ll never believe what happened to me. I came out of the gym to find an ad for a Brazilian on my car. No, not that kind of Brazilian. It was for an $80 hair treatment for split ends. Let’s stop right there. Lesbos don’t have split ends. We cut our hair too short. There’s no time between cuts for our ends to split. Consider this: how many lesbians do you know with long hair? Okay, maybe there are a few. They’re probably friends with the so-called lipstick lesbians; heck, maybe they are the lipstick lesbians! Anyone who uses lipstick has long hair, right? Look at Portia! Sure, maybe Ellen was a cosmetics spokesperson, but I can assure you, her short hair had no split ends. Before you accuse me of stereotyping, I want to remind you that as a member of this group, I retain all stereotyping rights. 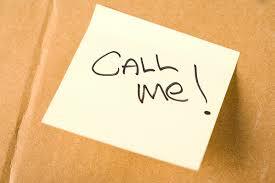 Then I woke up yesterday morning to a scrap of paper on the counter with a man’s name and number on it. J. had been out late the night before selling lottery tickets for cars at the Stampede. I figured she’d met someone nice in the ticket booth, struck up a conversation, he happened to need someone to marry him (to clarify, I mean “to officiate at his wedding”), so she told him she’d call him. Boy, was I wrong. J. is quite the little salesgirl. Over two long volunteer shifts, she convinced hundreds of naive people to part with their hard-earned cash. She’ll use any tactic to make a sale. I wonder sometimes whether she fully understands the line between friendly and flirtatious. She told me she had left her wedding band at home that night because of the heat wave. Yeah, right. She must have been batting her mascaraed eyelashes (I said nothing about mascara above) a bit too enchantingly because, some time after she sold a ticket to a very nice fellow, he swung by her ticket booth again. While she was busy trying to entice yet another unsuspecting customer to buy, she noticed this previous buyer leaving her a slip of paper. After finalizing her sale, she read the note and realized that Mr. Starry Eyes had left her his name and telephone number. As far as I know, J.’s slip of paper also wound up in the recycling bin. I do feel bad for the poor chap. But what could she do, call to tell him he was barking up the wrong tree? So remember, folks, if someone doesn’t call you, there may be a very good reason. Why remove my tongue from my cheek? I like it there. I had a long day yesterday, which I’m now going to review in excessive detail. Consider yourself warned. Yesterday Dr. As-Yet-Nameless sent me to the urgent care clinic to address my ailing finger once and for all. Following my teeny weeny ultrasound, Dr. AYN tried to treat the infection with antibiotics, which failed, so a more intrusive approach was called for. Needless to say, I wasn’t so excited about prospect. I commonly suffer from performance anxiety in triage. Rating my current pain as a 2 out of 10 would lead any triager to wonder why I came. I neglected to clarify that at one point the pain was a 10, and that the medication that is stopping my finger from returning to a 10 has resulted in my dramatic weight loss over the past month. I should have mentioned that, before I disappeared into nothingness, I needed action taken pronto. I understand why I was placed in the wait-forever line. I wasn’t in searing pain, I could easily skip lunch, and the problem would still be there whenever the doctor saw me. When the doctor entered my room, I learned that she considered the barbaric procedure I sought elective. When I think “elective” I naively think “breast implants” or “facelift” or “liposuction”. (Perhaps the surgery I should get to remove my tongue from its permanent lodging inside my cheek would also be elective.) After considerable internet research, I learned that “elective” does include those procedures that are sought out and paid for, but more broadly includes any procedure that is not deemed emergent. I’m sure you knew that already. The doctor and I may have differed on whether my procedure was elective. To me, what she needed to do to me needed to be done promptly. It wasn’t a tummy tuck! (I’ve always wanted a tummy tuck, but where would the surgeon tuck my ginormous spleen?) My finger needed to be dealt with before the infection spread to my bone (although at that point she’d likely agree it was emergent). If I could have done it myself, I would have. I am assertive with doctors. If I am at odds with something they say, I tell them. That very day, I questioned Dr. AYN’s directive that I attend the clinic rather than waiting for her to refer me to a specialist, but she insisted. There was no point in quibbling with Dr. Annoyed-With-Me over the definition of “elective” because, within minutes, elective or emergent, she’d be performing a barbaric procedure on me. Why anger her before she started causing me pain? She’d already proven she wasn’t the coddling type. Procedure now done, I still wonder whether I could have handled myself differently. 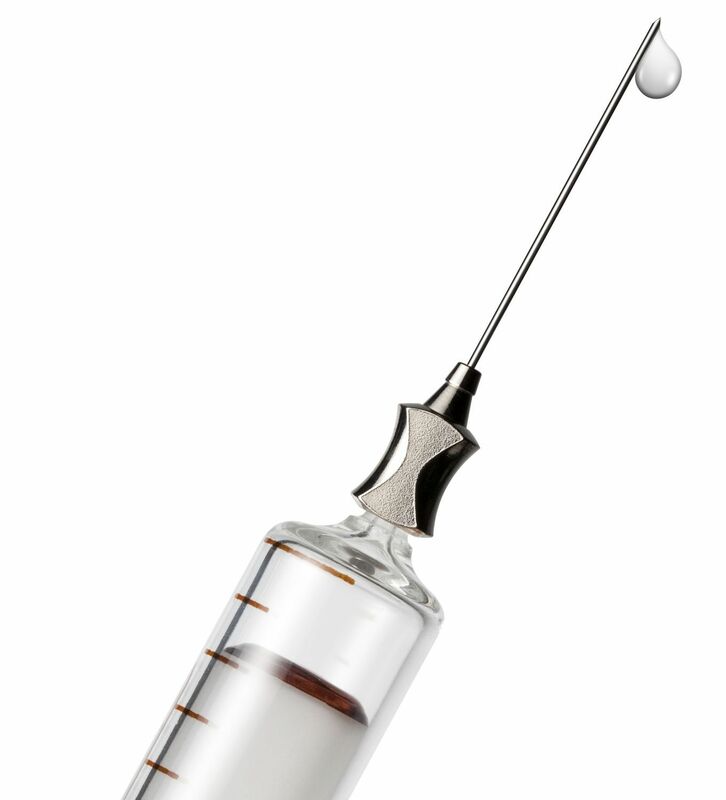 Was Dr. AWM punishing me for Dr. AYN’s misjudgement? Should I have protested Dr. AYN’s plan more vociferously? Was I at fault? Does it matter? It’s over, and my finger is really sore. And, Dr. AWM is referring me to a specialist to finish the job she started. Oh, I can’t wait! In the spirit of volunteerism, would anyone like to attend that appointment in my place? I’ll gladly loan you my photo-less health care card. I guess you’d need to borrow my finger as well, though. That could be more complicated. Forget it. That’s me in the top right corner. I must apologize for not writing yesterday, especially since I know how you hang on my every word. I spent the day carousing at the Stampede grounds. Just kidding. I’d rather sleep than watch adults young and old embarrassing themselves in public. 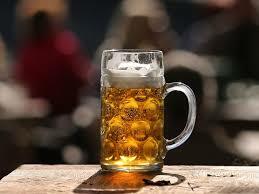 Stampede is a time for reckless alcohol overconsumption. With that comes an increase in philandering, and of course, STIs and unwanted pregnancies, despite the local campaign to “put a condom on your cowboy.” Not surprisingly, divorces spike following the week-long party. Stampeding sounds too risky to me, so I hunker down at home instead. J., on the other hand, plans two visits to the grounds with our good friend, Triple D. They will be there from supper time until midnight both nights, but they won’t have time for drinking or philandering; they’ll be selling lottery tickets for fancy cars. They are volunteering for this task in support of PALS. J. noticed that PALS was seeking people for this fundraising event, and not only did she volunteer for two long shifts, she signed up Triple D, who is known for always making time for a good deed. When I became a PAL, I learned that, in addition to our regularly scheduled visits, I’d be expected to support the organization in other ways. This included, for example, interviewing new recruits, helping out on the multi-station dog-assessment day, or attending fundraising events with or without my little pal in tow. Most of these activities involve longer hours than I have the stamina for, so I pass. I do my part by volunteering for one-time visits–last week’s parade is a recent example, although that day felt more like a gift than an obligation–on top of our regularly scheduled visits with the old folks. The same is true for Calgary Blood Services. I can’t donate blood, so I feed soup and cookies to those who can, and try to encourage healthy others to donate in my stead. I’m grateful to J. for persisting in giving despite her fainting after her second blood donation, and to my dear friend known affectionately as Spongebob (for reasons that will remain a mystery to you) who donated for the first time last month with no ill effects. Anticipating the milkshake he’d be buying on his way home probably helped him through the itty bitty pin prick. Maybe I shouldn’t say that I pass on the volunteer duties I can’t fulfill since the truth is that I pass them on to gracious and willing others wherever I can. I wish I could volunteer myself, but I know my limits. A 6-hour sales shift ending at midnight–assuming I did not sleep through the chaos like Jelly did at that parade–would knock me out for days. I also know that the screening interviewers at Canadian Blood Services would laugh at me if I tried to donate blood despite my leukemia. I know what my limits are, and that there are some things I can’t do, however much I wish I could. Kudos to those folks, J. et al., who donate their time or their gift of life (blood, that is) in my stead. Their generosity makes my heart sing, and I’m not the heart-singing type. People often think our city is defined by the annual Calgary Stampede, that everyone spends the week at the Stampede grounds to watch chuck wagon races. 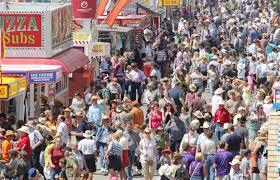 I used to attend Stampede occasionally, but stopped going after a traumatic experience there eons ago. I stupidly ate a corn dog and then hopped on a very twisty turny upside-downey ride, somehow forgetting that I suffered from motion sickness. Since then, I rarely visit the grounds, although I’ve heard, in addition to the adorable baby pigs, there are cooking demos and food offerings besides deep-fried Oreos. Now I’m reconsidering. You’ll be surprised to hear, then, that when PALS called for volunteers to participate in a special Stampede parade this year, Jelly and I volunteered excitedly. “Pick us! Pick us!” I wrote, closing with a seasonal “Yee-ha!” I’m sure Jelly would love nothing more than to be in a parade, surrounded by hoards of adoring fans cheering and waving. But this was not THE Stampede parade, the one that closes roads downtown for hours as 150,000 people line the streets watching endless floats and horses and marching bands pass. No, this was a special shorter Stampede parade held annually at the Alberta Children’s Hospital for those children who might not otherwise be able to participate. PALS has marched in this parade for the past 10 years. Then came the local heat wave. Sadly, the dogs were not allowed to march this year because the steaming asphalt would have fried their delicate paws. That meant all we could do was hang out in the shade and accept endless loving from adoring children and their parents for three whole hours. It was a sacrifice, but someone had to do it. Many young visitors swung by before the parade, petting the dogs and vibrating with the overstimulation. Loving parents snapped many a photo. What I did not realize was that, after the parade, all of the people who had been marching, along with those who’d been watching, would make their way over to hang out. The marching band, after a short break, reassembled nearby for another rousing song or two. The horses ventured within metres of the dogs and assembled briefly on the adjoining lawn before trotting off. There were princesses and Star Wars characters and mascots galore, there were lots of trucks, both with sirens and without. Even a few helicopters dropped in. Sure, I shed a few. Even happy sick kids made me sad. No child should have to hang out at this wonderful hospital, ever. I teared up when I saw the chairs set up for the oncology kids, set well apart from the potentially infectious crowds. When I saw a cheery policeman waving up at the building, and realized he was acknowledging the children too sick to leave the hospital right now, I was a goner. Thank goodness Jelly had brought Kleenex. How did my little PAL cope with the hubbub around her? 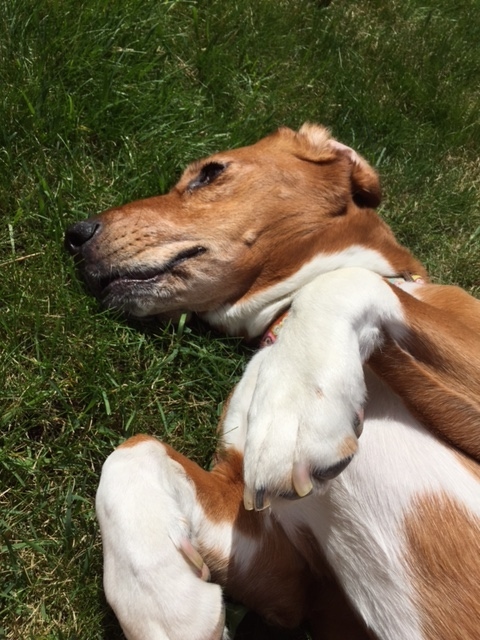 She found a patch of grass in the hot sun, laid down, and napped. Occasionally she raised her head, but she was largely oblivious to the endless children petting her. Thankfully, they didn’t seem to care. They say that being a love sponge is exhausting. Jelly is living, and sleeping, proof.